Now I’m not exactly a mopping kind of guy, which is why this five gallon idea has been so long in the coming. The last time I mopped a floor was when I moved out of my last apartment, and the next time I mop a floor will be when I move out of this one. Sometimes I wish all my flooring was concrete so I could just hose it all down when the grime gets out of hand. 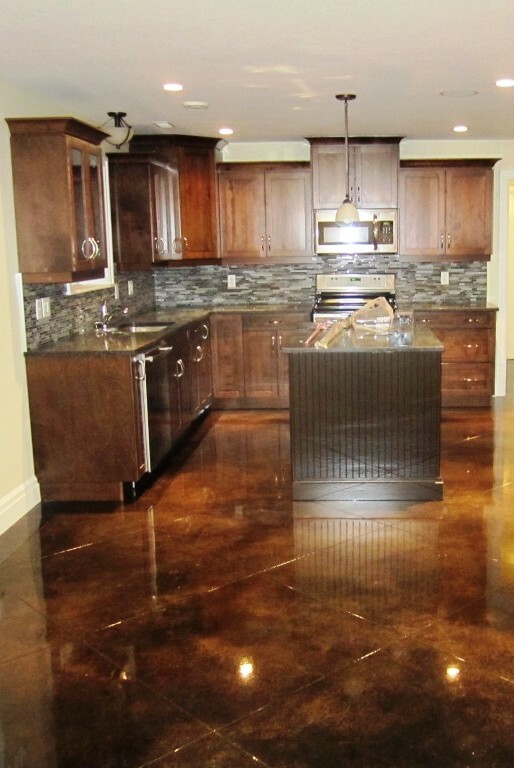 Concrete flooring can actually be very attractive, like the right-hand photo from Mollroi construction shows. 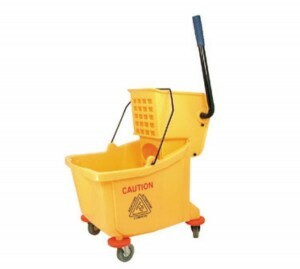 The mop buckets you’ve probably seen the most are these yellow wheeled contraptions from Rubbermaid. They’re a common sight in malls, fast food restaurants and high schools. As you no doubt already know, 5 gallons is the most perfect size for a bucket, and most specially-made mop buckets are around that size. 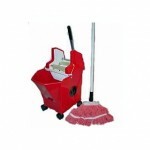 Mopping is made more efficient by adding caster wheels and a mop wringer, like shown in the left-hand image. We had mop buckets just like this one at the bagel shop I worked at as a teenager, and we’d put our feet in 2 of them and use them to roller skate after closing. Don’t try that yourself, it’s not remotely safe. But for home usage, you don’t need anything nearly this fancy. You can use any old 5 gallon bucket you’ve got lying around. 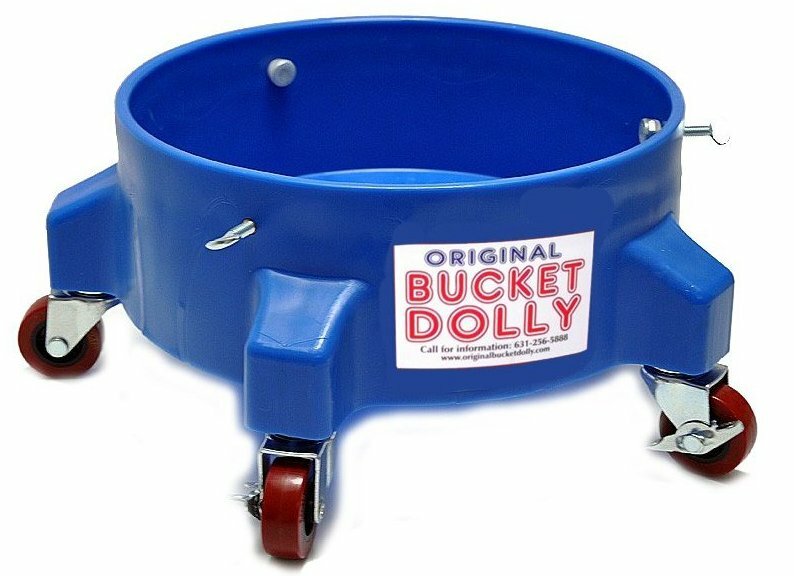 You can even add a wheeled base like the bucket dolly pictured below. I’m sure you can think of many more uses for a wheeled base, like making your own 5 gallon office chair by combining it with some 5 gallon bucket seating! As always, the possibilities for 5 gallon bucket engineering are limitless and exciting. Sometimes I can hardly contain my excitement. Just don’t do anything I wouldn’t do! Update: There’s too many different versions of mop bucket to list, but I’ll give it a go anyway. 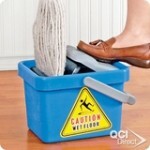 Below are some thumbnails of the most noteworthy mop bucket inventions I found when researching this article. Each thumbnail is linked to more details from the site I found it on. This one reminds me of the devices people had to use to wash clothes back in the dark ages. It’s from Behrens, and listed on Amazon. Have you ever thought that maybe mopping isn’t feminine enough? Yeah me neither. I guess this one’s more shapely than most mop buckets. This was found on Fred’s Home Store. 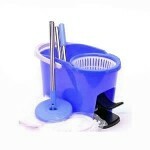 This one’s a great idea, and a good way to fit a wringer on an ultra-compact mop bucket. You’d be really hard pressed to find something smaller than this. Made somewhere in China, listed on Amazon. 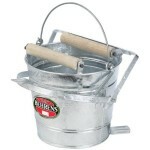 Ok you shouldn’t really use this for drying greens, but the principle is the same. It spin dries your mop. I’m not even sure how that works, but it’s got 4 stars on Amazon, so it must.